ROCKLAND HARBOR, Maine -- Keep her sails filled, and point her bow toward that mountain." The Heritage, which was designed and built from the keel up in 1983 by its owners, Doug and Linda Lee of Rockland, Maine, is the Lee family's business as well as its summer residence. With only those instructions to guide me, I grabbed the polished wooden helm and, for the first time, felt the power of a healthy gust pushing a graceful schooner across open water. Almost on cue, the wind stretched all seven sails, and heeling hard to starboard, the proud craft silently accelerated across Blue Hill Bay. It was a rare moment indeed for a novice seaman like me. Last Memorial Day was indeed memorable, as shortly after noon my son Zach and I leaned on the rails and watched crew members of the schooner Heritage cast off the wrist-thick bow lines that tied the sleek, two-masted vessel to the pier at North End Shipyards in Rockland Harbor. With her sails down and no onboard engine, the bow of the Heritage was towed away from the pier by the Clark Kent, a 16-foot yawl boat that had been lowered from her side. It was piloted by Linda Lee, co-captain and co-owner of the Heritage. As the bow cleared the pier's end, the stern lines also were dropped, and the Heritage was towed 100 yards into the harbor, her stern just narrowly avoiding the bowsprit of another schooner. The maneuver was a good introduction to the challenges of sailing before the wind. With his ship clear of shore, Capt. Doug Lee gave the order to raise the mainsail. Passengers and crew quickly formed a single file along each rail. Taking up the stout ropes of the mainmast gaff, that long, horizontal boom at the upper edge of the sail, we began to pull hand over hand at the first mate's direction. "Weigh haul away, we'll haul away together," several experienced salts sang out in time to the pull. It took a few moments to get a sense of the cadence and timing, but then we all hauled and chanted apace, the long lines landing in loose loops about our ankles. Then, with the huge white canvas sail fully extended, the order was given to "Hold, take two steps forward and drop the line." Gradually the Heritage began gliding across the choppy harbor. She was already gathering a wake as she nosed past the end of the long breakwater and into Penobscot Bay, heading due east toward Vinalhaven Island. Once the lines had been neatly coiled and hung, I found myself a comfortable spot leaning on the bowsprit and took in the entirely enjoyable bouncing slap of the waves and chilly breeze. Since this wasn't open ocean but relatively, shallow, sheltered coastal waters, there was no sense of sea sickness, even for a landlubber like me. In fact, the Heritage was the first sailing experience for both me and my older son, Zach, who'd recently graduated from college. We'd boarded the schooner late the previous afternoon, following an easy US Airways flight from Pittsburgh to Portland, Maine, and a comfortable, shuttle ride 80 miles farther north to Rockland. Our first sight of the Heritage was also memorable. Ninety-four feet long at the keel and 24 feet across the beam, the sleek, white-painted, gold-trimmed vessel was tethered expectantly to the pier, her two towering, bright-varnished, Douglas fir masts swaying slightly in the wind waves that rippled across the harbor. We were directed down the forward companionway to our cabin, one of the 15 passenger compartments shoe-horned into the ship's lower deck. Consisting primarily of an upper and lower berth fitted into the curve of the hull, our cabin had barely enough floor space for one person to turn around and use the tiny sink in the corner. Other than a translucent porthole in the ceiling, the only illumination came from a tiny, 12-volt D.C. bulb. The thin, wooden walls that partitioned us from the adjoining cabins provided only a semblance of privacy. But then, comfort and privacy had not been high on our list of expectations for the voyage, though perhaps we were seeking illumination of another kind. The Heritage was designed and built in 1983 by its owners, Doug and Linda Lee. Maine native and son of a marine architect, Doug came to windjamming early in life, working on a schooner in which his father was part owner. He wooed Linda, then a fellow college student, on a sailing trip. The Heritage is the Lee family business, and for the past 18 years, the family's summer residence, albeit one with berths for 30 guests. Unlike most of Maine's other windjammers, the Heritage was built expressly to provide its passengers with both an authentic coasting schooner experience and more than a modicum of creature comforts, at least by schooner standards. The 19th-century sailing crafts and traditions have been lovingly preserved in myriad details of design and construction. Most obviously, the Heritage has no onboard engine for navigation, which makes for a far different experience and aesthetic than petroleum-powered vessels. In fact, other than navigation equipment and the small, two stroke, "donkey" engine used to raise the anchor, the Heritage runs on the power of wind and man. Sails are raised and lowered by hand, and when the ship drops anchor for the night, passengers ply the oars of two long boats, Archie and Lois Lane, and row ashore. A week's worth of food, water and electricity are stowed in various cold hampers, tanks and battery banks. Perhaps even more impressive, meals for 30 passengers and crew of seven are prepared three times a day on a wood-fired cookstove. They are served either family-style in the cozy galley, which is lit with warm oil lamps, or in an informal buffet line set up on deck. That same cookstove provides all the hot water for the ship. The bill of fare is consistently hearty and flavorful, big breakfasts, rich luncheon chowders, along with a seemingly endless supply of fresh baked bread and cookies. There's plenty of meat and fowl, but a vegetarian would not go hungry. Although the crew does most of the heavy lifting, everyone helps in the preparation and wash-up chores. Although they are tiny, the cabins are sufficient. Several even have double beds and private toilets. Other bathroom facilities are situated on the main deck, along with a common shower. When necessary, small stoves are lit at night to heat the cabins, but otherwise, thick wool blankets provide the only warmth. Well thought-out and well maintained, everything on the Heritage is, well, shipshape from stem to stern. By rubbing its brow, a person can hypnotize a lobster and even teach it to do headstands. Overall, the onboard ambience might be compared to a comfortable, friendly B&B at sea. The passenger list was eclectic, roughly half male and half female, though not all couples. Ages ranged from 22 to 80. Close quarters and casual camaraderie certainly make for an enjoyable and shared adventure, which is one reason why so many passengers seem to be repeat customers. Several make a week on the Heritage an annual event. As for organized onboard activities and entertainment one might expect on a cruise ship, there are none on the Heritage, other than enjoying the scenery and conversations with passengers and crew members. Some get actively involved in the ongoing chores of sailing and maintenance of the ship. Other folks are happy to pass the time reading on deck. There's always a group gathered around the helm, where Captain Doug, schooner expert and accomplished raconteur, holds forth with a steady spate of nautical lore and Down East humor. He knows the waters of this section of mid-coast Maine like the back of his hand and enjoys sharing that knowledge with his guests. Every island, rock and channel seem to have both a name and story to go with it. With no set schedule other than the days of embarkation and debarkation, each Heritage cruise is different. The daily itinerary depends entirely on the wind, the weather and the whim of the captain. Rather than specific port calls, the sailing is the primary destination, with the most reliable winds generally coming in spring and fall. That first afternoon, the breeze was light and out of the west. After sailing for two hours through the summer-home-lined channels of Vinalhaven Island, we pulled into a quiet channel off spruce-capped Isle au Haut and dropped anchor for the night. The long anchor chain made a most satisfying clatter as it rattled over the side and plunged into the deep, darkening water. Snuggling into woolen blankets made for deep, silent dreams. Folks were up at first light, sipping coffee on deck and watching the mist fade over the water. After breakfast, we sailed steadily southeast toward the open ocean looking for better winds out of the lee of the land. After making a long, listless loop for most of the morning, we finally picked up a steady off-shore breeze and spent the rest of the afternoon tacking back to shore. As evening approached, we glided into Tenant's Harbor, a village some 20 miles down the coast from Rockland. The village of Stonington on Deer Island, Maine, provided the week's "civilization fix," offering a place to post mail, make phone calls and buy souvenirs. Approaching the narrowing harbor under full sail and a stiff breeze, we sped by South Island and the summer compound home of painter Andrew Wyeth and his heirs. Another schooner, the Isaac H. Evans, was already there. With a deft maneuver, Captain Doug brought the Heritage skidding in to a neat 180-degree turn almost simultaneously dropping the sails and anchor barely 100 yards from the Evans. The shoreline was ringed with homes, and after dark, their lights formed a twinkling halo around the harbor. After dinner, as we stood on deck chatting, there was a power failure on shore and all the lights suddenly went dark, leaving only the opalescent glow from the two schooners and several million stars, an eerie but beautiful tableau. After breakfast, several volunteers rowed ashore, and we bought back the fixings for dinner, 90 pounds of live lobster picked directly from the lobster pound. Lobster bakes on the beach are a main element in many Maine windjammer cruises, and the covered hamper in which ours were stored would be eagerly regarded by all throughout the day. 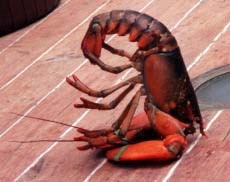 One crew member even demonstrated how live lobsters can be put to sleep by rubbing a finger lightly between their brows. Once asleep, lobsters can be stood on their heads, which seemed somewhat bizarre, considering the fate that awaited them. Sailing out of Tenant's Harbor, however, required another lesson in seamanship, as the light breeze was coming from the southeast direction. Raising only the triangular jib topsail attached to the bowsprit, Captain Doug was able to coax the Heritage into a slow turn around her anchor chain, which he had slowly winched in. As the bow swung toward the mouth of the harbor, he had the mainsail raised and, at the apex of the turn, ordered the anchor popped up out of the mud. As pretty as you please, the Heritage slid out of the harbor. That day, we sailed northeast, skirting Vinalhaven Island and entering the slalom-like channel off Deer Isle, past the village of Stonington. The twisting channel was studded with sharp spits of rock, but consulting the chart and judging the change of tide, the captain maneuvered the ship like a race car. Sailing in the open sea is one kind of challenge, steering around an ever-changing obstacle course is another one, especially in a vehicle with lots of momentum and no real brakes. It was midafternoon when we dropped anchor in the quiet cove of uninhabited McGlathery Island. After rowing ashore, with the lobster hamper perched on one of the seats, Zach and I set off for an hour's hike around the island. When we found our way back to the beach, dinner was almost ready, preceded by the traditional "Lobster Dance," performed by the captains and crew. We enjoyed a primal feast on the beach, fresh steamed lobster cracked open on available rocks, and corn on the cob, all drenched in melted butter. It was more calories than anyone could consume. That evening, Zach captured the ship's attention, as he climbed out to the tip of the bowsprit and took a flying leap into the water. He surfaced quickly and gasping, the cold water having sucked his breath away, but he managed to paddle back to the ladder, to the ship's applause and my relief. On Thursday morning, we hoisted anchor and sailed back into the picturesque village of Stonington on Deer Isle, where we had a two-hour shore leave, our civilization fix of the week, to post mail, make phone calls, buy souvenirs and replenish personal supplies. Then, we sailed farther north to Mount Desert Island. Crossing the open waters of Blue Hill Bay was where I had my chance at the helm. That evening, we anchored in Pretty Marsh Harbor, just off Acadia National Park. On Friday, we started sailing back south toward home port. Our course carried us through Eggemoggen Reach and under the high bridge that links Deer Isle to the mainland, which provided another moment of excitement. Since the clearance under the bridge at high water was 85 feet and the height of our masts 102 feet, four crew members had to climb up and lower the tops of both masts so we could fit through. Even at that, it was a close call. One crew member standing atop the mast was able to smack the underside of the bridge deck as we glided beneath it. That evening we cruised into Cradle Cove, on Isleboro Island. This is the site of the legendary Xanadu, the sprawling summer home of Charles Gibson, the turn-of-the-century impresario who founded the Gibson Girls. More recent celebrities, including John Travolta, also have summer homes there. We arrived to find two other schooners anchored in the harbor, in anticipation of a predicted change in the weather for the worse. Sure enough, we awoke the next morning to a stiff gale blowing from the northwest, "a breeze of wind," as Captain Doug referred to it. The two other schooners motored out of the harbor, but Captain Doug used the sails to get the Heritage backed up and turned in the proper direction. He had us reef the main sails, or partly lash them to the boom so that only half the canvas could unfurl. Then, at his signal, we quickly hoisted the two main sails. The Heritage took off like a rocket straight south toward Rockland. Once out of the lee of the island, we really picked up wind and, even with 40 percent of our sail reefed, reached a speed of 11 knots, or something approaching 12 miles an hour. That may not seem like much compared to vehicular velocities, but for a 160-ton vessel like the Heritage, it's practically warp speed. The Heritage was really flying as she cleared the end of the Rockland breakwater. Then making a tight arc back into the wind, Captain Doug had the sails quickly lowered, and we coasted across the harbor toward the pier. Like a well practiced drill team, the crew made a dozen adjustments in quick succession. As our speed dropped, the Clark Kent was lowered, and the Heritage was nosed gently back into her berth at North End Shipyards. I remember being surprised how quickly the week had passed and in retrospect realized we'd been on a wind-powered time machine. The Heritage provided a thoroughly relaxing, low-key respite from normal routines and modern distractions, an opportunity to sample a unique sailing experience without undue exertion, expense or anxiety. Despite the absence of modern amenities, organized activities or exciting ports of call, our days on the Heritage had slid by easily and engagingly, with a natural ebb and flow that is the movement of the tides, the rhythmic revolutions of night and day. I felt connected to the earth, the sea, my son and my fellow voyagers. No wonder so many Heritage passengers come back again and again. Schooners are sailing vessels with two or more masts and gaff rigged sails set fore and aft. That means there's a boom attached to the top edge of the sails, which run parallel to the ship's keel, rather than across it. Schooners designed both for speed and maneuverability and to be sailed by smaller crews than square-rigged vessels. In the centuries before steam engines, schooners were workhorses of the Western Atlantic. Some were designed primarily to sail the open sea. Others, so-called coasting schooners, were built with broader hulls that could carry heavier loads along the shallow, shifting waters of the coastal shelf and rocky shoreline. As little as a century ago, thousands of coasting schooners still shuttled every conceivable kind of cargo up and down America's eastern seaboard, racing each other to get goods and passengers to port first. Although sailing schooners survived the development of power vessels, they could not compete with the coming of railroads and highways. By the mid-1930s, schooners were on the verge of extinction. Then Frank Swift, an artist from rural Maine, got the idea of offering schooner voyages to "rusticators," folks who wanted to get away from the hustle and bustle of the life on land. Buying an decrepit hull, he had it fitted out with simple accommodations and began offering guests a week's escape sailing among the thousands of tiny islands and inlets of mid-coast Maine. That was the birth of the "windjammer" vacation. The term once used derisively by steamboat captains now refers to any large sailing vessel that carries guests on overnight voyages. 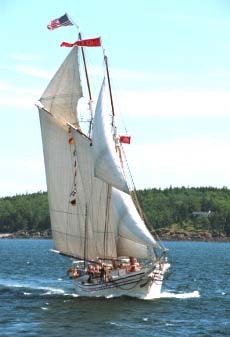 Other captains eventually bought up old schooners that had survived and offering windjammer cruises along Maine's coast. In 1977, their owners formed the Maine Windjammer Association, which now represents 13 vessels operating out of the harbors of Rockland, Rockport and Camden, Maine. About ten old work schooners have been re-fitted to accommodate paying passengers.